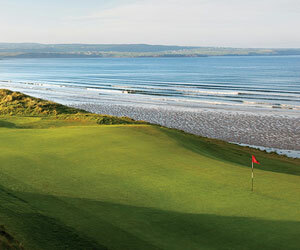 Dublin is Ireland's largest and most tourist-friendly city, with marquee attractions from the Book of Kells to the Guinness brewery, But Ireland's best known golf courses are almost all on the west coast, in the northwest or in Northern Ireland. Because of this, many golfers on wish-list trips never set foot in the capital. That's a shame, because a trip to Dublin can combine the charms of all things urban and Irish with exceptional -- and inexpensive -- links and parkland golf. The Dromoland Castle Hotel in County Clare, Ireland is celebrating its 50th anniversary as a luxury destination in grand style. The main building, completed in 1835, remains one of the most authentic castle experiences in all of Europe. What's new at this historic Irish retreat ranges from small details, such as a new logo, to big additions -- the purchase and $1.5-million renovation of a nearby inn. The five-star Castlemartyr Resort in Ireland combines centuries of history with modern flair. A reported 90 million Euros were spent to renovate a 17th-century manor house and build a separate hotel wing over a two-year period before opening in August 2007. The resort's golf course is often overlooked by club-wielding foreigners, but savvy locals love it for its affordability and playability.